Fall, fall, fall, guys! It’s heeeeere!! As if pumpkin beer, pumpkin frappes, pumpkin lattes, pumpkin breads, and pumpkin desserts haven’t been thrown in your face enough already to make that point abundantly clear, we just wanted to make it blatantly clear that we’re excited. 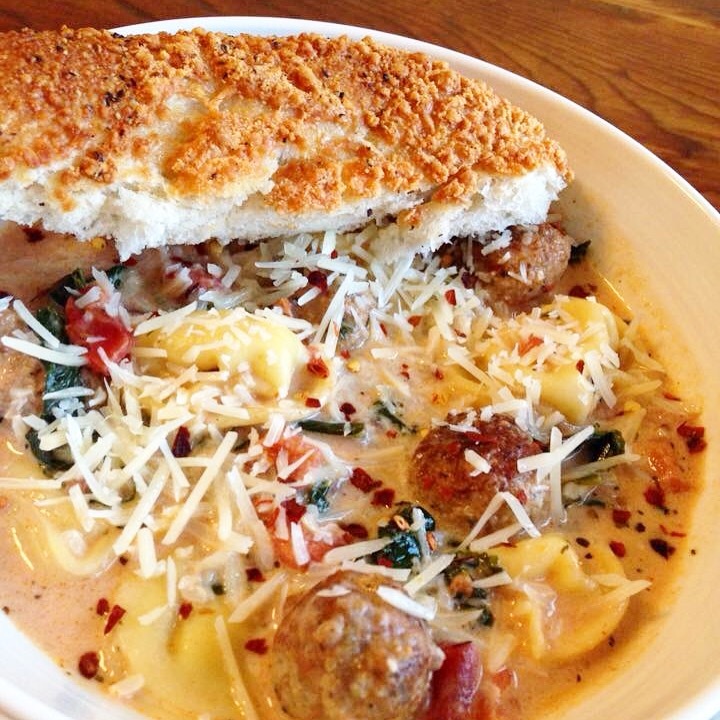 That may have been a little drawn out, but how else are we supposed to convey how stoked we are for soup season? And, yes, pumpkin season. As you know, fall equals soup followed by a chowder which then equals staying home hunkered down in comfy clothes and moccasins. Okay. So perhaps “hunkered down” was the wrong term there. It’s not the dead of winter.. yet. Until then, and even when that time comes, here is a delicious, hearty, flavorful soup that will have your taste buds singing as well as your family’s and friend’s! Our 2-year-olds couldn’t get enough! 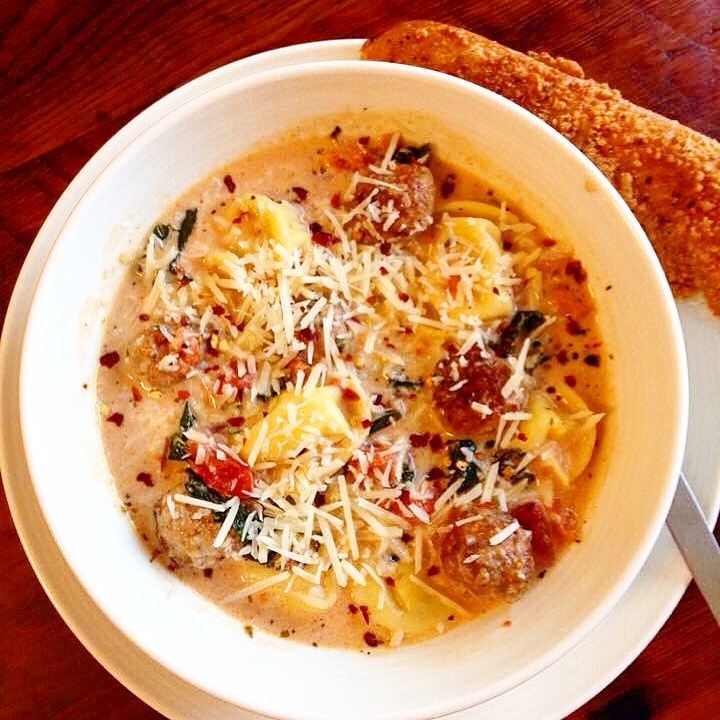 The tortellini make this soup a little more filling, and the meatballs make it that much heartier. And that kale will trick your psyche into thinking this is the most healthy meal you’ve eaten all week. This soup holds just the right amount of spice and will be sure to warm your bellies on a cool evening. Oh, and the heavy cream. Have we mentioned the heavy cream? Heavy cream is our mister-ress. That’s not a word, but we’re goin’ with it. Now go find your soup pan, your ladle, and those moccasins, and let’s make some soup! Red pepper flakes and 4 Italian Cheese to top before serving! –Place chicken broth, cream of chicken, canned tomatoes(juice and all), garlic, minced onion, Italian seasoning, red pepper flakes, bay leaves, salt and pepper in a large pan on stove. We start to let this let this simmer when prepping other ingredients. –Now go make the meatballs. Recipe below. 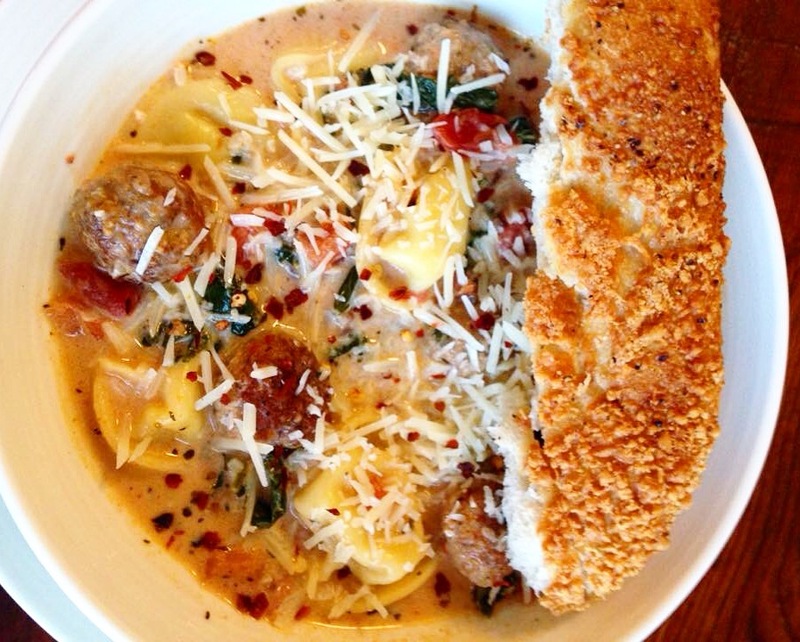 After browning the meatballs on the skillet, add them to your soup. Right before serving cook, your tortellini per directions on package in a separate pan. Add tortellini, chopped kale, and heavy whipping cream. Stir and simmer until warm! –Top your bowl with red pepper flakes and 4 Italian shredded cheese! Serve with warm buttered focaccia or french bread! 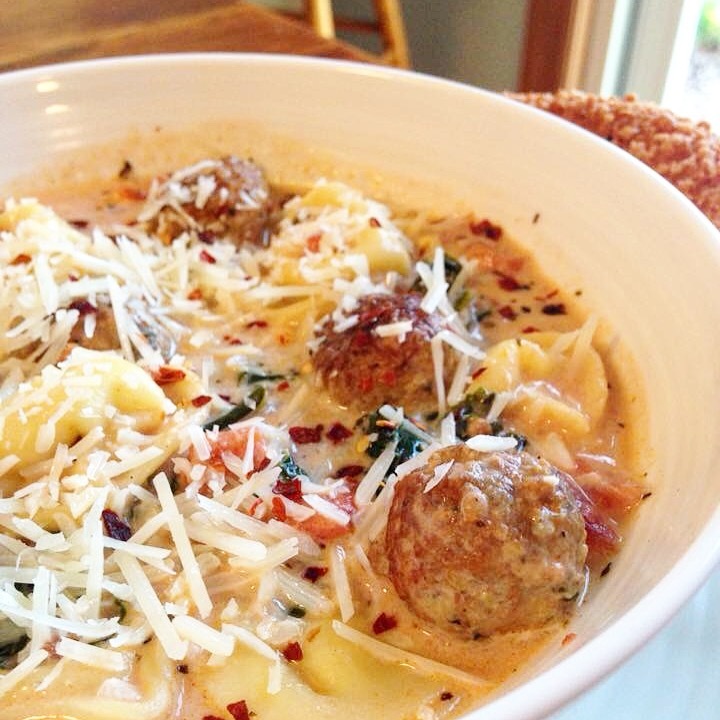 These meatballs stand alone on their own even without the soup! There are many other dishes these little blessings would compliment! –Place all ingredients in a bowl and mix with hands until all ingredients are mixed. Roll into small balls (about a a teaspoon worth of meat). We put olive oil in a skillet on medium and browned the outsides and let them finish cooking in the simmering soup! We have no beer mention this week, but this is a must. Go and stop by this grocery store, Graziano Brother Italian Grocery Store, from 1912 in Des Moines if you get a chance! This place has such a cool history, and you’ll be sure to find so many products to stuff your cupboards with! These seasonings will take your dishes from mediocre to grandiose! You might think you can’t tell the difference from your cheaper grocery store chain seasonings to something you spoil yourself with, but good quality seasonings make a WORLD of difference. Grazaiano’s Italian seasoning is probably the best Italian seasoning ever. In fact, we’re going to be bold and say not probably. It most definitely is the best! If you are making any dish that requires Italian seasoning, make the trip and buy your seasonings at Graziano Brother Italian Grocery. Their Italian seasoning is coarse, so vibrant, and loaded with flavor. It’s not dull like most other Italian seasonings you buy. They add some red pepper flakes in their mix, which in our world, red pepper flakes are king. Red pepper flakes for president! We strongly recommend you go check out their grocery store in Des Moines! You can get an 8 ounce bag for only $3.95! 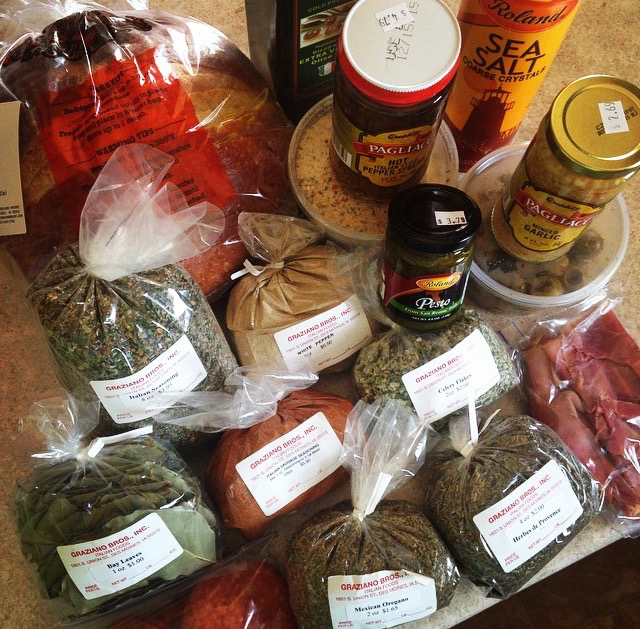 They also have a great selection on other spices, meats, cheeses, homemade pastas, bread, and pizza crusts! Oh, and their olives — well, that’s another day, another whole blog post dedicated to those babies! To learn more, click here. And, do note, if you go, you will go crazy and want to buy the whole store!! You’ve been warned. Your spice cabinet will smell great and your recipes will thank you! It’s worth every single hard-earned penny. Now, if you would, please excuse us as it’s 10:30 and almost lunch time. We have leftovers to devour. You won’t believe the flavor this soup takes on after everything’s been marrying for a day!